Back in February Burger Conquest and Thrillist Rewards road tested a new menu item at South Houston in NYC called “The Bulldog.” It’s a house-made deep Fried Hot Dog served in a bun and is layered with a Fried Egg, Hash Browns, American Cheese, Beef Chili & Sour Cream. Then the entire thing is wrapped in Bacon and then baked until crispy. It was invented by the owner of South Houston, Michael Carpiniello and it’s a fantastically epic gut-busting food item. It’s also now available for a limited time through Thrillist Rewards for a special price of $25. The reward comes as part of a 3 course meal with a craft beer of choice (I suggest the unfiltered River Horse Lager!) Do not miss out on this amazing reward!!! 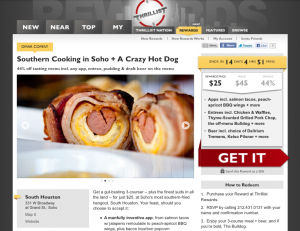 As you know by now, I have joined up with the Thrillist team to help create these sweet Rewards. My favorite part about them is that every single Reward that goes live on Thrillist is road-tested by the team themselves to ensure the utmost in quality experiences. If you read the “how it works” section of the Thrillist Rewards site you’ll see “Thrillist-Approved,Custom Experiences. We team up with our local contacts to develop an itinerary of can’t-miss things to do in your city each week.” Well let me tell you fellow eaters, it’s 100% the truth. Enjoy an inside look at Thrillist road-testing for Reward creation but I would defintely go buy the Reward first before it runs out!! Got a restaurant, bar, experience or local business that you think is right for a reward? Drop me an line. This entry was posted in Best Burger in New York, Burgers, Gourmet Burgers, Hamburgers, New York and tagged bacon bourbon popcorn, bacon wrapped, bulldog, burger, cheese, ciancio, conquest, french, fries, gourmet, great, hamburger, hot dog, house made hot dog, liver pate, meat sword, new york, ny, nyc, rev, review, rewards, saber, south houston, the, thrillist. Bookmark the permalink.